Waitrose Aberdeen Angus Beefburgers (available prepacked and from the service counter) are made with beef from cattle which are bred from pedigree bulls, for assured quality and taste. Served with salsa, which should be made in advance, and seasoned with Cajun spices, they are ideal for a barbecue party. In a bowl, combine all the ingredients for the salsa. Cover and store in the fridge until ready to serve. Make it a few hours in advance to allow the flavours to develop. Preheat the barbecue or grill. Rub 1 tsp of the Cajun seasoning into each side of the burgers. Grill or barbecue for 5-6 minutes each side until thoroughly cooked, the juices run clear and there is no pink meat. Lightly toast the slices of ciabatta on each side. 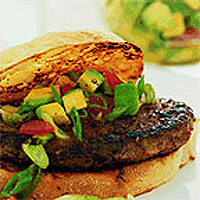 Place each beefburger on a ciabatta slice and top with the salsa. Serve with the remaining slices of ciabatta, Waitrose Gourmet Tenderleaf Salad and oven-roasted tomato salad. If the weather lets you down, create the barbecue effect by griddling the burgers. Preheat a griddle pan until hot, then cook the burgers for 5-6 minutes each side, until the juices run clear and there is no pink meat. As an alternative to the ciabatta, use Waitrose Italian Ciabatta rolls.